How do you cheer up an unhappy ape? With a harp! Terri Tacheny enjoyed taking her daughters to Como Zoo in St. Paul. But there was one problem. The gorillas, orangutans and monkeys often lacked energy, she thought. So she came up with a solution. It's a little music. Now Tacheny plays the harp once a month for an appreciative animal audience. The listeners amble down to the barrier as soon as Tacheny begins to set up. She plays a beautifully carved wooden harp. For 10 years, she's volunteered to perform at the zoo. "I don't speak gorilla. But there's a gorilla purr that occurs when I begin to play. And that's their happy sound," said Tacheny. She is 57 years old. As the sounds of Tacheny's harp drift through the zoo, a male gorilla stares at her. Then he chews contentedly on vegetation. Families stop to snap pictures. Tacheny's regular job is as a therapeutic harpist. She plays for hospital patients. It helps them deal with pain and anxiety. She thought if the music helped calm humans, it would work for the primates too. "I would love to see every zoo have a harpist. I think it benefits the animals," Tacheny said. Tami Murphy is a zookeeper at Como. She said Tacheny has played for all the animals. Some aren't interested, Murphy said. But the harp music "seems to be a really calming thing for the apes to listen to." Tacheny says she's never gotten a bad response from the apes. "I've never had anything thrown at me," she said. I really like it is a great that the ape is happy and she is. I never knew that someone could and would play music for animals. I don't know anyone who plays the harp. She must be really talented. That is awesome. And super cool. I wonder how she dose that. 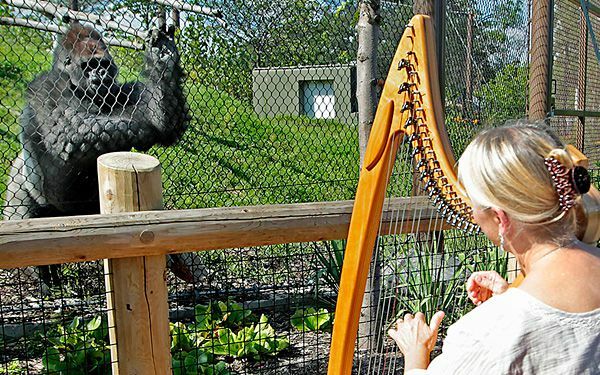 I think it was a great idea to make apes happy by playing the harp because music really calms people and if really might be worth it to make animals calm. Everything that sounds soft and quiet make animals inspired. I agree that musical instruments like harps can make apes really really calm. I learned that some instruments make animals calm. I am amazed because some instruments make animals calm. 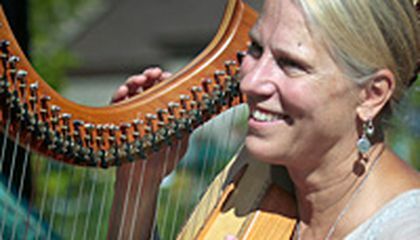 This article is about a 57 year old woman that plays the harp for animals at St. Paul zoo. One of the zoo keepers said some of the other animals don't like it and some do but the ones who like it the most are the apes. The woman Tacheny also plays the harp for patients at a hospital. Tacheny said that it calms the patients down so she thought it would work for the animals and it did. That's what this article is about! This article is about a unhappy ape that was very grumpy and a therapist she would play her harp for the children that were sick.One time she brought her harp to the zoo and played her harp for the apes and the ape was happy.